Acid mine drainage (AMD) is an acidic mineral solution that flows out of a mine. The phenomenon in question is spontaneous and involves metal sulfides (type “M” Sx) with no economic value in mining. Indeed, during mining work (excavations and pumping), the chemical balance of these outcrops and deep deposits are disturbed by sudden changes in oxidation-reduction conditions. This reaction is of sufficient magnitude to cause large flows. As I already wrote in my previous article, AMD from mine waste and contaminations of soils and water with metals are considered as major environmental problems in mining areas. Consequently, acidification would increase the dissolution of toxic metals from tailings, waste rock piles, and open pits. Therefore, soil and water ecosystems will be contaminated. Certainly, as rainwater infiltrates the underground soil/rock, it can cause pore-water flow in the pore space of the soil/rock. The resulting pore-water flow can react chemically with the mine waste, dissolving metals at the mine site. Since the dissolved metals can be transported in the soil/rock through pore-water reactions, they can contaminate both the land and the groundwater at the mine site. In a study conducted with colleagues from the University of Marrakech (Morocco), we have analyzed the impact of mining activity on the surrounding soils around the abandoned of Kettara mine (Morocco). The objectives of this study were to (i) characterize soils and tailings; (ii) determine the geochemical background of chemical elements in soils of the region; and (iii) propose geochemical maps regarding the selected elements. 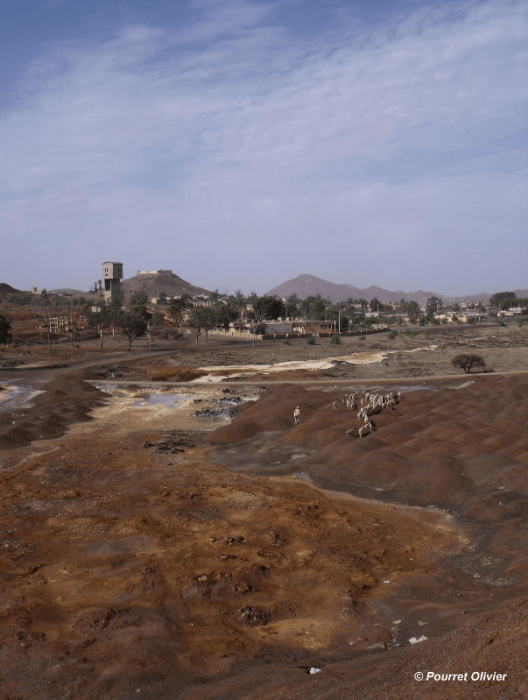 Indeed, one of the most serious environmental issues related to the mining industry in Morocco and around the world is pollution from abandoned mine sites. Mine waste is an obvious source of soil contamination. Climatic effects such as heavy rainfall engender metal dispersion in semi-arid areas since soils are typically scarcely vegetated. 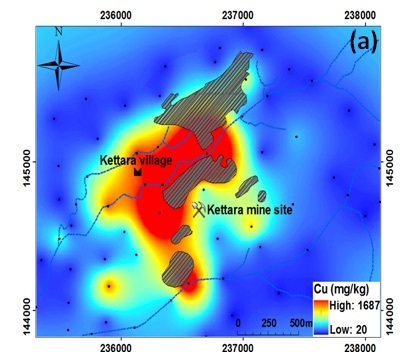 In this study, we assessed the extension and magnitude of soil contaminations with toxic elements from abandoned Kettara mine in Morocco, using geochemical analysis and geostatistics for mapping. Soils and mine waste were sampled and analyzed for 41 chemical elements. Based on the enrichment factor, only four metals and one metalloid of interest (Cu, Pb, Zn, As, and Fe) were selected in this research. A geochemical background was determined using exploratory data analysis, and geochemical maps were elaborated using geostatistics in a Geographic Information System environment. The obtained results showed that Kettara soils are contaminated with metals and metalloids that exceed the established geochemical background values (Cu≈43.8 mg/kg, Pb≈21.8 mg/kg, Zn≈102.6 mg/kg, As≈13.9 mg/kg and Fe≈56,978 mg/kg). Geochemical maps showed that the deposited mine wastes are responsible for soil contamination, with released metals and metalloid that have been dispersed downstream from the mine waste, mainly through water after rainfall. The comparison of these findings with the geochemical background reveals the degree of pollution of the Kettara mine site’s surrounding soils and raises the question of possible health risks. 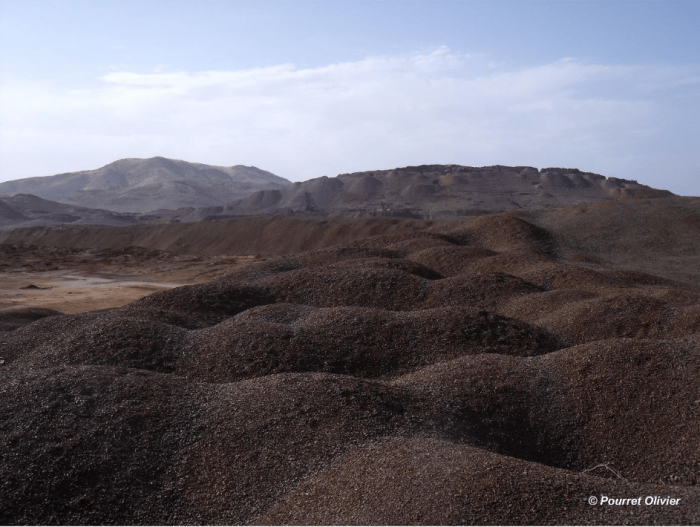 For sustainable development and environmental planning, the current study will serve as a reference for politicians, managers, and decision-makers to assess soil contamination in abandoned mine sites in Morocco. These findings are described in the article entitled Assessment of soil contamination around an abandoned mine in a semi-arid environment using geochemistry and geostatistics: Pre-work of geochemical process modeling with numerical models, published in the Journal of Geochemical Exploration. Further studies on the pollution of the groundwater were performed by my colleague from UniLaSalle, Lahcen Zouhri (Moyé et al. 2017). Khalil, A., Hanich, L., Bannari, A., Zouhri, L., Pourret, O., Hakkou, R., 2013. Assessment of soil contamination around an abandoned mine in a semi-arid environment using geochemistry and geostatistics: Pre-work of geochemical process modeling with numerical models. Journal of Geochemical Exploration, 125: 117-129. Moyé, J., Picard-Lesteven, T., Zouhri, L., El Amari, K., Hibti, M., Benkaddour, A., 2017. 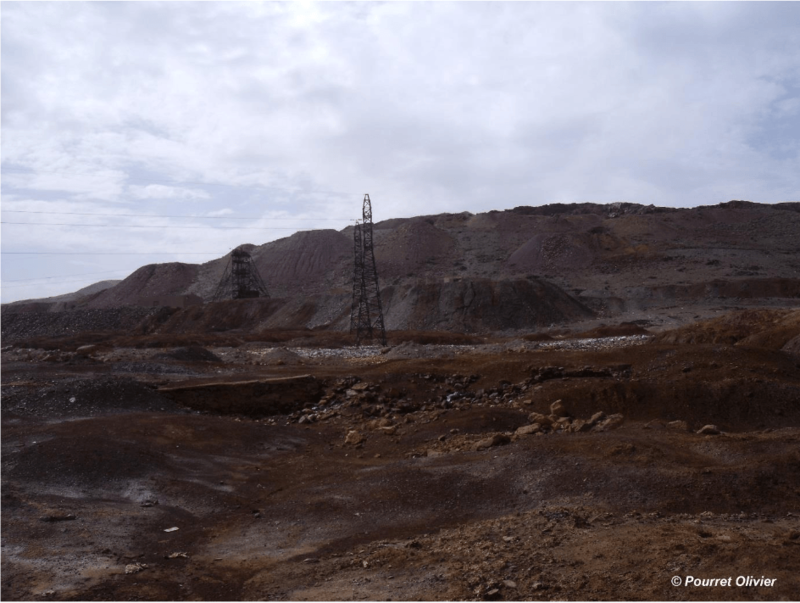 Groundwater assessment and environmental impact in the abandoned mine of Kettara (Morocco). Environmental Pollution, 231(Part 1): 899-907. 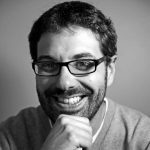 Previous Post« Previous Do Children’s Developmental Vulnerability Vary Over Locations?